APULIA, region in southern Italy, including Calabria until the late Middle Ages. According to an ancient tradition the communities in *Bari , *Oria , *Otranto , and *Taranto were established by captives deported from Judea by *Titus . The constitution of the Western Roman emperor Honorius of 398 confirms that the several Jewish communities in Apulia were liable to the civic burdens. The numerous tombstone inscriptions, many wholly or partly written in Hebrew, found in *Venosa , Taranto, Matera, Bari, Brindisi, Otranto, and Oria attest to the large number of Jews settled in the region, and the wide usage of Hebrew language and names. Inscriptions found in Venosa indicate a remarkable communal organization and Jewish participation in civil life. Emperor *Basil I (867–86) attempted to persuade, and then to force, the Jews of Apulia, then part of the Byzantine Empire, to adopt Christianity; according to the Chronicle of *Ahimaaz , *Shephatiah of Oria obtained the emperor's consent to exempt the Jews of Oria, and possibly also the whole of Apulian Jewry, from this order. Oria was occupied by the Arabs in 925. Many of the Jews there were killed or taken prisoner during the fighting while others escaped to Bari or Otranto. Emperor Romanus I Lecapenus (919–44) again tried to compel the Jews to adopt Christianity. Attacks by the populace to convert them forcibly lasted several days, and many Jews were massacred. The situation of Apulian Jewry became less precarious in the 11th century, and it was a period of flourishing cultural life. Distribution of Jews in southern Italy in the second half of the 12th century. Jews in Apulia maintained regular contacts with the centers in Ereẓ Israel. The Chronicle of Ahimaaz (1054) contains many details on Apulian Jewry, and relates both true and legendary tales of pilgrimages to Jerusalem and of Abu Aaron ( *Aaron of Baghdad ), a miracle-worker and teacher, who established a school and taught mystical lore in Apulia. Hebrew letters and poetry of a high standard were encouraged. Apulian poets of the period include *Silano in Venosa, Shephatiah and his son *Amittai in Oria. Scholars are mentioned from the middle of the tenth century in Oria, Bari, and Otranto. The *Josippon chronicle, composed in about the middle of the tenth century, is a product of the southern Italian Hebrew culture. The physician Shabbetai *Donnolo lived there in the tenth century. South Italian Jewry was the original fount of Ashkenazi culture (see *Ashkenaz ). That the Jews of France and Germany recognized their debt to the Apulian center as late as the 12th century is acknowledged in the proverb quoted by the French tosafist Jacob b. Meir *Tam : "For out of Bari goes forth the Law and the word of the Lord from Otranto" (cf. Isaiah 2:3). Noteworthy in the 12th century was the mishnaic commentator *Isaac b. Melchizedek , from the famous academy of *Siponto . The position of the Jews in Apulia continued to be tolerable until the last decade of the 13th century. Most of the communities were under episcopal jurisdiction. Jews in Apulia acquired land, were occupied in crafts, and practically monopolized the dyeing industry. Thomas *Aquinas , a native of southern Italy, is evidently referring to Jewish economic conditions in Apulia when advising the Duchess of Brabant in 1274 that "it would do better to compel the Jews to work for their living, as is done in parts of Italy, than to allow them… to grow rich by usury." Scholars of the 13th century include *Isaiah b. Mali of Trani the Elder, his grandson *Isaiah b. Elijah di Trani , and Solomon b. ha-Yatom. The period of toleration came to an end under Charles II of Anjou. Apulian Jewry was all but annihilated between 1290 and 1294 after he gave orders that all the Jews in his realm were to be forcibly baptized. Many fled from this persecution to the Orient; others who resisted were killed, while a large number accepted baptism. Most of the synagogues were converted into churches, and the schools were closed down. A considerable number of the converts led the existence of *anusim , adhering to the Jewish beliefs and practices in secret; they became known as the neofiti (neophytes; see *Crypto-Jews ), officially recognized as a distinct group and dealt with accordingly by the authorities. To facilitate their supervision the neofiti were frequently forced to live in special quarters. They were regarded by the populace as faithless heretics. In 1311 King Robert directed that those who had relapsed to Judaism were to be severely punished; the order was renewed in 1343 by Joanna I. In the second half of the 15th century the new Christians of Manfredonia were still listed as such in official documents. Both neofiti and Jews, who again settled in Apulia in the 15th century, were frequently subjected to mob attacks; anti-Jewish outbreaks occurred in Bari and *Lecce in 1463. The invasion of Otranto by the Ottoman army in 1480 had disastrous consequences for the Jews, who were all killed by the Turks. The second half of the 15th century saw Jewish immigration into Apulia from other countries. In particular the exiles from Spain and Portugal contributed to a short-lived renascence of Jewish learning. Isaac *Abrabanel and others composed notable works while staying in Apulia. When in 1495 the French king Charles VIII occupied the kingdom of *Naples , however, the Jews of Apulia were again persecuted; looting and war levies dissipated their resources within a few months. The persecutions resulted in widespread conversions and "New Christians who converted since the coming of the French" are mentioned in the laws of 1498 of King Frederick of Aragon. After the return of the Aragonese dynasty to Naples the Jews enjoyed a few years of security, but the conquest of Naples by the Spaniards was followed by renewed suffering. In 1510–11 the Jews were expelled from Apulia and the entire kingdom of Naples, only 200 families being allowed to remain. In 1515 the neofiti were also expelled. 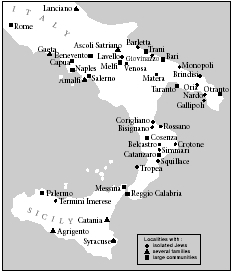 The grant of limited residential and commercial rights to Jews throughout the Neapolitan provinces in 1520 led to the reestablishment of a few communities. A new decree of expulsion issued in 1533 was canceled shortly before its implementation, but was reissued and finally promulgated in 1540, obliging all Jews to leave Apulia the following year. Apulian Jewry as an historical entity thereby came to an end. Some of them migrated to central and northern Italy. Others settled in Constantinople, Adrianople, Salonika, Arta, Valona, and Corfu, where they founded separate Pugliese (Apulian; Heb. פוליאסי, פלייסי) congregations. The dialect long spoken by the Jews of Corfu contained words from old Apulian. Milano, Bibliotheca; Milano, Italia, S.V. Puglia; Roth, Italy, index; Roth, Dark Ages, index; J. Starr, in: Speculum, 21 (1946), 203–11 (Eng. ); L. Levi, in: RMI, 28, nos. 3–4 (1962), 132–53; Cassuto, in: Judaica, Festschrift H. Cohen (1912), 389–404; G. Summo, Gli ebrei in Puglia dall XI al XVI secolo (1939). ADD. BIBLIOGRAPHY: B. Ferrante, "Gli statuti di Federico d'Aragona per gli ebrei del regno," in: Archivio Storico per le Provincie Napoletane XCVII (1979); V. Bonazzoli, "Gli ebrei del regno di Napoli all'epoca della loro espulsione. Il periodo aragonese (1456–1499)," in: Archivio Storico Italiano CXXXVII (1979), 495–539; C. Colafemmina, Documenti per la storia degli ebrei in Puglia nell'archivio di stato di Napoli (1990); idem, "Documenti per la storia degli ebrei in Puglia e nel Mezzogiorno nella Biblioteca Comunale di Bitonto," in: Sefer Yuhasin, 9 (1993), 19–43.